Sarah as a Speaker: Sarah excels in leading innovative sessions in which participants share knowledge, experiences, and questions to derive insight into common problems in health care. With more than 25 years’ experience teaching health law in addition to her clinical background, Sarah can explain multiple components of our health care system, answer questions about the morass of laws in medicine and connect seemingly disparate factors that add to the problems participants face. By supplying that context, she facilitates conversation in groups, from which participants leave with new clarity about old issues, ideas & tools from colleagues, and a refreshed view of how they can provide meaningful leadership for their practice or institution. As a Keynote speaker, Sarah brings clarity to audiences of diverse backgrounds about our health care system- why it has changed over the years and how it is likely to serve all of us in the future. 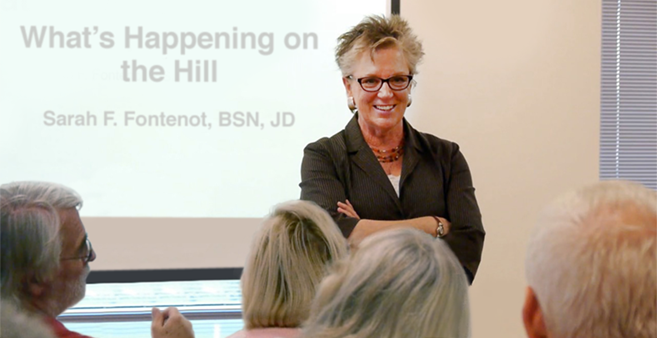 These Keynote presentations are appropriate for health care professionals and layperson audiences. Population Health is a Team Sport- What Will it Mean for You? *I started this with an article for Texas Medical Liability Trust’s 40th Anniversary- as a keynote, I can expand/reduce its scope to reflect the sponsoring organization’s tenure. The need for leadership in all sectors of the health care system is well known. Excellent coursework, intervention, and tools are in place to build the leaders for tomorrow. But do those new leaders understand their future battlefield? Do they recognize the myriad of forces changing the delivery of care continuingly? This program defines the context of the current legal framework of health care and provides an opportunity to take a broader view of the forces that generated those laws. Participants are left with a better understanding of today’s issues- but more importantly- a clearer vision of the future of the American health care system. This program is a broad discussion about health care law & policy, and the direction the federal government is steering medical care. Sarah provides content on five to fifteen (depending on time) of today’s issues in health law, then has the participants guide the order and length of conversations through their questions and level of interest. By the end of the session, the participants have more knowledge on current challenges in health care, greater clarity on how they fit into the health care structure of tomorrow, and increased appreciation for the importance of their leadership among their colleagues. "The education that she has provided our members over the years has been extremely valuable to them as indicated in continuous outstanding evaluation results, as well as requests to have Sarah return to our symposia to present again."